Anyone looking for a big (and we mean really big) monitor upgrade this holiday season may want to check out AOC's AG352QCX, a massive 35-inch curved display with a 200Hz refresh rate that's due out in December. AOC is using a MVA panel with a curve radius of 2,000 millimeters for a better sense of immersion, or at least that's the pitch behind curved displays (I'm not a big proponent of curved monitors, though do feel they're a better fit for computer monitors than for televisions). 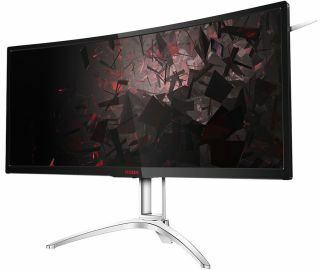 The 35-inch monitor also has a 2560x1080 resolution (21:9 aspect ratio) with a 200Hz refresh rate that's native to the display (read: not overclocked) for fast gameplay, a 4ms response time, and adaptive sync (supporting FreeSync) to keep stuttering and motion blur from ruining things. AOC rates the brightness level at 300 cd/m2 and the contrast ratio at 2,000:1 (50,000,000:1 dynamic contrast ratio). Viewing angles check in at 178 degrees vertical and horizontal. Connectivity options include D-Sub, DVI, HDMI 2.0, and DisplayPort 1.2a. There's also a built-in USB 3.0 hub with two USB 3.0 ports and a pair of 5W speakers. The stand supports swivel, tilt, and height adjustments, though it doesn't pivot, nor would you probably want it to since it's a curved monitor. AOC says the AG352QCX will go on sale in Europe this December for €799. There's no word on when it will be available in the U.S.